Cap 6-14 cm broad, convex, expanding to plano-convex to nearly flat in age, sometimes with a low umbo; margin at first incurved, becoming decurved, occasionally upturned; surface dry, when young, dark-brown to purple-brown, appressed fibrillose or with flattened scales, darkest at disc, becoming paler towards the margin as a whitish ground color is revealed; flesh white, unchanging, thick, firm when young; odor and taste mild; pileal surface turning green in KOH. Gills free, close, moderately broad, pinkish-brown, bruising reddish-brown, blackish-brown at maturity. Stipe 6-16 cm long, 1-2 cm thick, stuffed/hollow, equal to somewhat enlarged at base; surface more or less smooth at the apex, covered with cottony scales below; veil membranous, upper surface striate, lower surface white, cottony-fibrillose, forming a thin, membranous, superior ring. Spores 4-6.0 x 3.5-4.5 µm, smooth, elliptical; spore print blackish-brown. 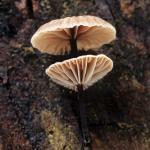 Solitary, scattered to sometimes in arcs in mixed hardwood-conifer woods; fruiting from early to mid-winter. 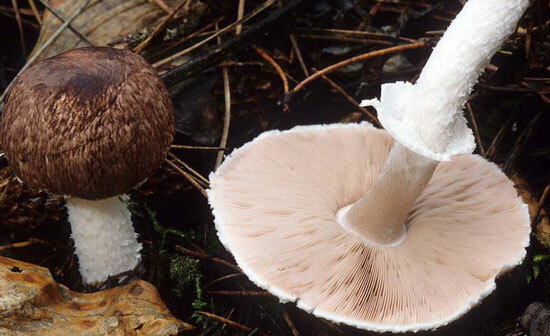 Agaricus subrutilescens is recognized by a dark-brown to purple-brown, appressed fibrillose-scaly cap, stipe with conspicuous cottony scales below the ring, and forest habit. It is most likely to be confused with Agaricus hondensis, a toxic species, with which it sometimes fruits. 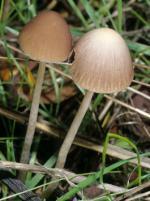 The latter, however, has a cap with tan to buff-brown scales, a thicker ring, and a bulbous base. If in doubt, KOH will give a yellowing reaction in Agaricus hondensis while the pileus of A. subrutilescens will turn green.